We offer a variety of memberships for your budget and needs. We offer a membership option to suit everyone's budget and needs. Anyone that wishes to to use our facilities as part of their membership rather than just dropping off or mailing in film for development is required to register for and attend an orientation session. Orientation sessions are hosted every other Saturday morning from 10am-Noon and require a $25 registration fee. Access to a private Facebook group and Slack channel with networking opportunities, exclusive content, how-to videos. $300 lab credit to be applied towards drop off or facility rental services -- that's up to 50 rolls of color film processing, or 20 hours in the lab! Economy and Professional members are granted 24/7 coworking access to our gallery space. Use it to meet with clients, work on your laptop, or just hang out. Free coffee for everyone! 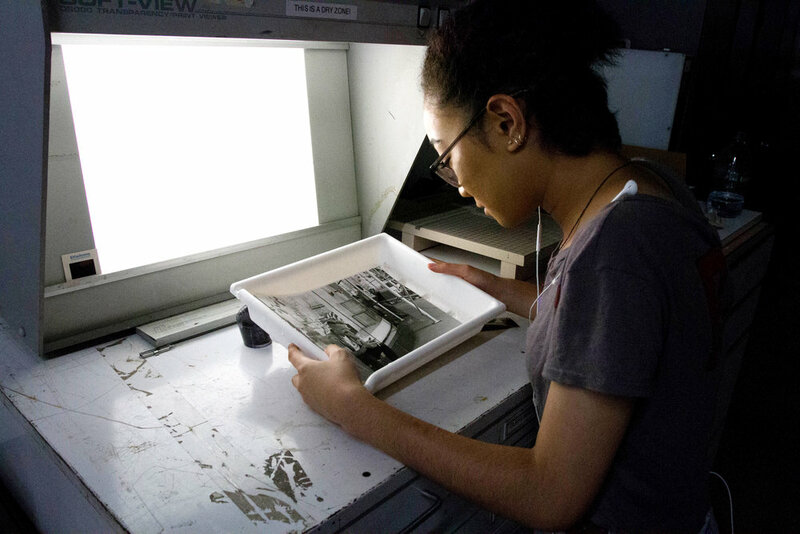 Lab hours include access to B&W and color gang darkrooms, B&W film developing station, and the digital darkroom which includes a variety of computers, film, and flatbed scanners. Members must "clock in" on our website when they enter the lab area. Lab hours can be used any time, day or night. All basic chemistry is included. Film development credit option is perfect for people who shoot a lot of film! Drop off or mail in your film. Your account is debited at our standard drop-off rates. Pro memberships are the best option for anyone who plans to spend a lot of time printing, scanning, or developing. The labs are available to you 24/7, as much as you need them. Pro memberships also include 1 full day in our skateable cyclorama studio each month. Normally billed at $75/hour, this is a great deal for occasional studio shooters, especially if you're also into skateboarding! Easels and trays for printing up to 20"x24"
Access to yet another growing and thriving film community in the neighborhood!